Creatine is found mainly in red meats, it is the ideal supplement to give you explosive strength and power in your workouts. It’ll also help you to build size in skeletal muscles. Our creatine is of very high quality offering 999.9mg of pure creatine per 1000mg (1g) of powder. This is mixed into a tablet containing 400mg of pure micronized creatine monohydrate. Micronized creatine is micro-particles of creatine monohydrate that are 20 times smaller than regular creatine powder allowing rapid uptake by the body. Our micronized creatine powder is HPLC tested for purity. The high purity level revealed during tests show that whilst using PB Supplements creatine you are less likely to experience water retention or stomach upsets. Creatine will enable you to burst through your Personal Best during anaerobic sports such as weight lifting. It is also an essential supplement to aid ATP production in the human body. 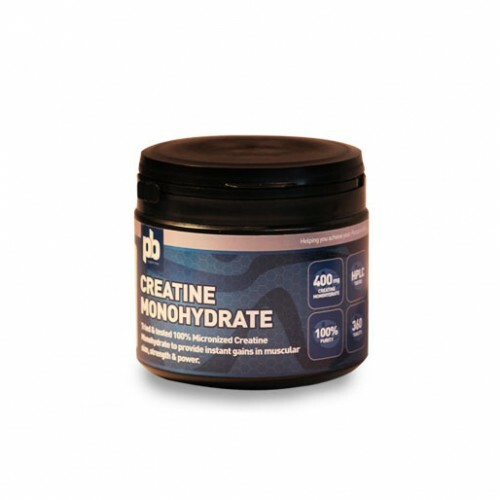 Creatine will help you to break through any plateau you may be experiencing during training. It is mainly used by those performing or training in anaerobic sports, however research has also shown its radical benefits in aerobic sports. Creatine supplementation increases the intracellular pool of phosphocreatine in skeletal muscle. Phosphocreatine provides a reserve of energy to rapidly regenerate ATP, which is consumed as a result of muscle contraction. Creatine has been studied in hundreds of clinical trials and has shown benefits including increased muscle strength, power and size (Sundell et al., 2011). Take up to 6-10 tablets daily depending on training intensity. Take for 6-8 weeks and then stop completely for 2 weeks to allow the body to wash-out, then repeat the process to see further gains in muscle size, strength and power.